Foods rich in iron can help you maintain a healthy store of red blood cells, which promotes overall health. Here lists the foods from major food types. Iron rich foods are an essential part of a healthy diet. Getting iron from a variety of sources will help your body manage the naturally fluctuating iron levels in the body, ensuring that you will have a healthy supply of red blood cells. If you have a condition that does not allow you to absorb and maintain iron properly, talk with your doctor about how to alter your diet to provide additional iron sources. Why We Need Foods Rich in Iron? Iron is an essential mineral that allows the body to produce red blood cells. If the body does not have enough iron, you can develop anemia or iron deficiency that will lead to a lower level of red blood cells. As your body rids itself of old blood cells, it will not be able to replace them, which will lower your ability to supply your cells with oxygen and nutrients. Consuming foods rich in iron will help ensure that your body will have enough of this mineral to produce a plentiful amount of healthy red blood cells. Consuming foods high in iron after an injury or when you have a condition that causes bleeding will help your body replace its lost blood store more quickly, aiding in your recovery. Those who have a condition that limits their ability to absorb iron will need to consume iron from a variety of sources to avoid developing anemia. Iron can be found in a variety of food sources. Taking in iron from a variety of food sources daily basis will help ensure that you have a healthy store of iron as your red blood cells naturally shift. Iron in food sources can come in heme and nonheme forms. 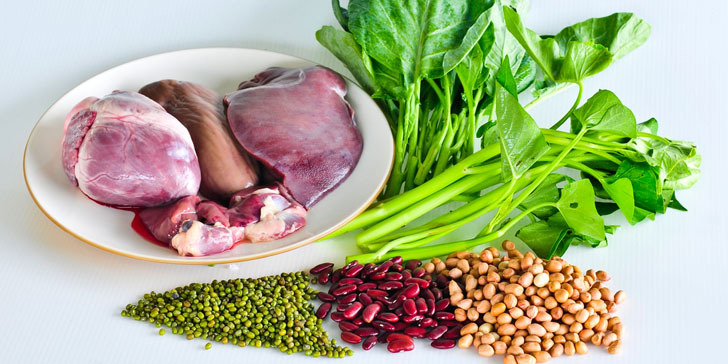 Heme iron is found in animal tissues. Your body can absorb up to 30 percent of these stores. Nonheme iron is found in plant and animal based foods. Your body will only absorb 2-10 percent of these stores. Increasing your intake of vitamin C can increase your ability to successfully absorb iron. Dark green vegetables including spinach, chard, kale, collards, beet greens, or dandelion greens have high stores of iron. Eating these greens raw vegetables increases the amount of iron in your blood stream. Other vegetables containing iron include peas, broccoli, string beans and sweet potatoes. Grains can also contain a high level of iron. Bleached grains will not contain a sufficient amount of iron. White breads or flours that are enriched will contain iron, but not at the level as their natural counterparts. Bread and cereal products containing iron include: whole wheat bread, wheat products, rye bread, cream of wheat, bran cereal, oat cereal, corn meal, enriched rice, enriched white bread, and enriched macaroni. Some seafood contains high levels of iron which can be beneficial. Fish contains heme iron which is easier to absorb. Shellfish including oysters, shrimp, clams and scallops contain high level of iron. Other iron rich foods include tuna, mackerel, haddock, dried cod and sardines. Fruits can also contain high levels of iron. Fruits that are highly fibrous tend to have more adequate stores of iron. Fruits with high levels of absorbable iron include dates, figs, prunes, raisins, dried apricots, prune juice, dried peaches, strawberries, and watermelon. Meat is one of the best sources of heme iron. Doctors frequently recommend that those who are iron deficient increase their intake of beef, lamb, liver, liverwurst, ham, veal, pork, dried beef, kidney, brains, heart, tongue, chicken, and turkey to allow for higher iron stores. Those with high cholesterol or dietary issues should be conscious of the meats they choose. Some meats such as beef or pork can be high in fat or sodium. High intake of these foods can lead to other health issues including high blood pressure or excessive weight gain. Talk with your doctor about which foods would make an appropriate iron source to suit your dietary restrictions. Dried beans and peas also contain high levels of iron which can be absorbed. These sources will need to be rehydrated in order to be consumed. Breakfast products such as instant breakfast, maple syrup, molasses or corn syrup also contain iron, but these sources should be consumed sparingly. These contain high levels of sugar and artificial ingredients which can cause additional health trouble. Eggs also contain a high level of iron. There is more iron in egg yolks than in the whites of the egg. Raw Honey and Pure Honey: What Are the Differences?